The first day of competition of the Fifth Raid international Gaspésie started this morning at 8:30 am, under the radiant sun of Saint-Georges-de-Malbaie, with the majestic Percé Rock as a background. The 150 athletes took off in a bucolic decor to do a series of sports disciplines such as cycling, swimming, running on trails and on the seashore, without forgetting canoeing, which gave a hard time to some teams less familiar with the technique. 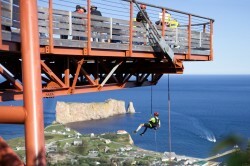 The 74 teams doing the 300 km or 150 km courses explored the area of Mount St. Anne, including a cave, and they took on the spectacular suspended glass platform of the Global Geopark in Percé, where an impressive section of ropes was waiting for them: a zip line and an abseiling descent from the platform. The strong winds today have forced the organization to put the zip line in standby for a while. Third position: Volkswagen et Kia New Richmond (Daniel Barriault et Jano Poirier) with a time of 8:17:0. First position: Local team Pabok (Rémi Castilloux et Alex Clément) demonstrated that they knew their playground well by finishing with a time of 7:06.36. Second position: Les Jeunesses (Antoine Moses et Raphaël Arsenault), a team from the region, with a time of 7:11:20. Produits naturels Mondias is in third place with a time of 7:14:24. Tomorrow, the athletes will start their journey at 8:00 am at Cap Mont Joli in Percé to arrive in the afternoon at the mouth of the Grande Rivière, in Grande-Rivière.